Dave’s op amp problem turned out to be from the rails (or so he says!). The “burden of experience” had him testing (and had Chris guessing) at all the wacky things it COULD be before checking what it actually was. Learning how to read schematics comes with time. 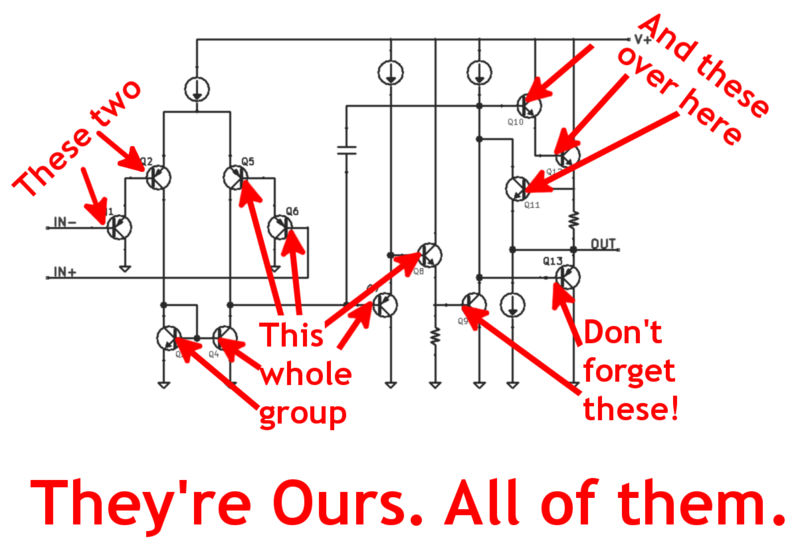 Bob Pease schematics were notorious for being hard to read. Would there be interest in doing obfuscated circuit contests? Chris just got back from Hamvention, down in Dayton OH. It was great!There was a meetup on Saturday evening, where some t-shirt wearing listeners came to hang out. They were awesome! Thanks to Bill Boyer (far right) for the picture! eBay significantly reduced the flea market from its former glory, but the selection was still pretty wide. And there were over 24K people in attendance! Dave used to buy test equipment overseas and resell locally. Chris feels terrible for forgetting his name, but the awesome person in red directly behind Chris in the picture gifted him a challenge coin, a really cool tradition in military circles. Mystery solved! It was Michael Hill! He also was the one who left his Ray Bans. Two for one! Dave says coins are a traditionally hidden and traded item between geocaching teams. Perhaps Dave should include a collectible coins as a donation level in his yet-to-be-announced Pozzible campaign? Thanks to our sponsor for this show, Club Jameco! Go to http://ClubJameco.com/TheAmpHour to see the J-bot kit discussed this week and to learn more about submitting your own kit idea for fun and profit! Arduino had some announcements at Maker Faire this week: They will be releasing a branded robot kit and a wifi based Arduino called the Yún. It will have a co-processor running a version of Linux and a wifi stack. Jeri Ellsworth and business partner Rick Johnson announce their new project spun out from Valve at Maker Faire. MAKE (and the MakerShed) will be expanding its offering and its partnership with Radio Shack. Former guest, Jack Ganssle, has a great newsletter called The Embedded Muse. Someone wrote in about Partkeepr, a linux based inventory tracking system. How do you manage your parts? Will anyone build a vending machine for parts for Chris? Kickstarter, anyone? Bunnie did a great teardown of the Formlabs Form1. Can’t wait to hear more about the low cost SLA printer. The cost of school is still very prohibitive and really handcuffs many people with debt afterwards. A new program has been announced between Georgia Tech (a top 5 engineering school), Udacity and AT&T. They will be offering a Master’s Degree in CS for less than $7,000! Tinkercad is back! They were acquired by AutoDesk and will be opening up the platform again! Former guest Andrew Seddon and the Circuit Hub team announced they now have support for KiCAD! Whee! theonetruestickman (on reddit) submitted his workbench for WBotW. Looks like a really neat space! Lost and found: At the end of the meetup at Hamvention, Chris found a pair of Ray Bans. If you lost a pair, please send an email to chris@theamphour.com. Chris, you mentioned learning Python in this show and I was curious if you’ve seen Learn Python The Hard Way (available free here http://learnpythonthehardway.org/book/ ). It’s meant to be a very pragmatic and opinionated way of teaching the language, with a major focus on writing programs. I liked it a lot because each lesson is short and to the point. Check it out if you haven’t seen it already. Good tip! I had seen that when my wife took up interest in learning programming. Seems like another good method. Chris, I really enjoyed meeting you at Hamvention. It was too bad I could not attend the get together Saturday evening, but the FDIM banquet was well worth it. Oh crap! Hide the contraband! Yay, another Arduino wifi shield at 3x the price of TP-Link TL-WR703N, but this time _IT IS_ TP-Link TL-WR703N (ar9331). They basically took TL-WR703N and transplanted it into a shield PCB at triple the price. Lets hope it will introduce Arduino people to Linux and make them migrate away from AVRs. Although knowing them we will still see project using three 400MHz 32bit boards chained together just to turn on the light over the internet. So snarky, I love it. 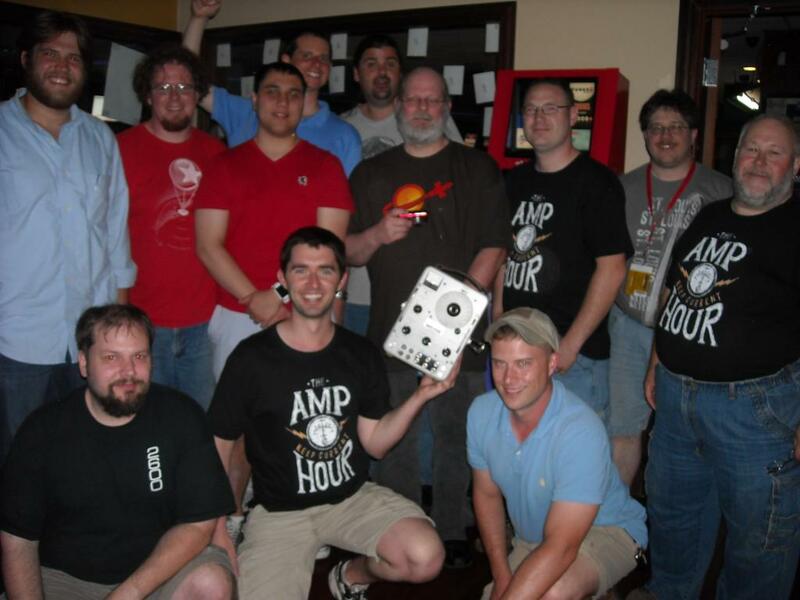 FYI – hamfests are generally early morning events, at least in the US. Around here (NJ), most open up for vendor/seller setup around 6AM, and open for buyers by 7 or 8. They usually are wrapping up by 11-12. Chris, you should check into locally run hamfests, might be a good place to find parts, equipment, etc. of course they’ll be orders of magnitude smaller than Dayton.